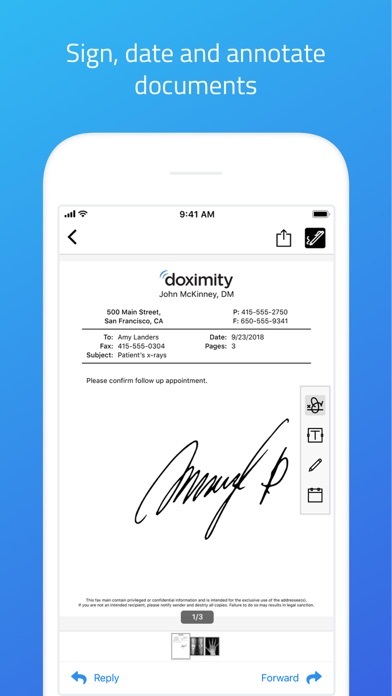 The dialer and fax functions of Doximity have made life outside of the office enormously easier. These are very valuable tools for physicians who need to work “on the go”, with nothing more than a laptop and a cell phone. The Dialer is amazing. It keeps patients from calling me back on my cell or having to deal with the “this cell does not accept calls from blocked numbers”. It has made my call much easier. 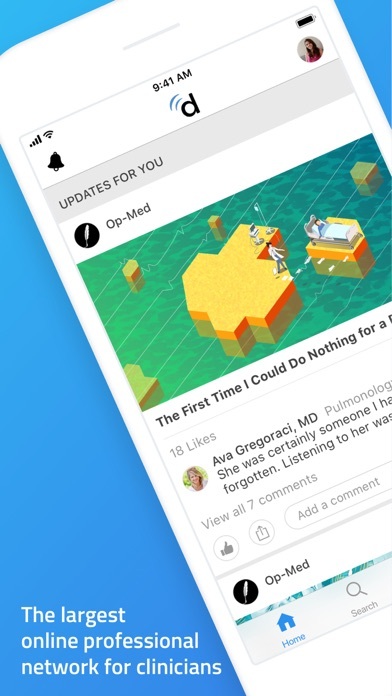 This APP is nice but not at all user friendly with idea sharing, publication sharing, or innovation supporting. Highly relevant and up to date articles. Great way to stay connected with colleagues and old classmates. The phone feature is awesome. Can call patients back displaying my office number instead of cell# if I decide to use this feature. Amazing service and product, amazing app!!! Use the dialer all the time and it’s been fantastic! The social media aspect is pretty good too. I use just about everything in this app. I really like the dialer. Makes calling patients much easier. 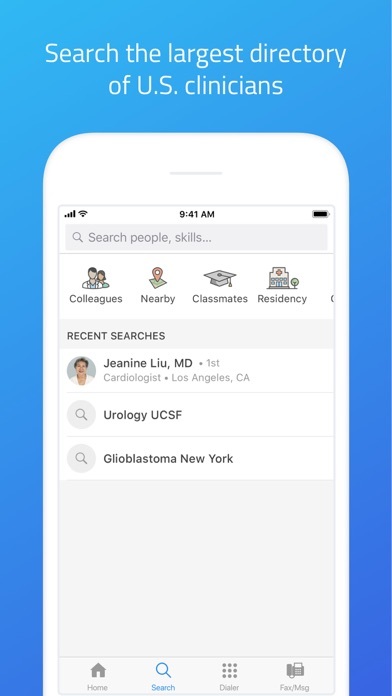 The office screening call feature is very helpful for calling patients but I’m frustrated that when I click on articles from Doximity on social media the app just opens a screen prompting me to download the very app I’m using! Seems silly. Was unable to fax and had a terrible experience with email costumer service but it was eventually corrected with an update and a everything is working perfectly. Someone called me to help. I used to love this app! The dialer is still great. Recently an update separated inbox from outbox which was great. Unfortunately it also stopped allowing me to share PDF from other apps. Writing Rx in a PDF editor then sharing directly to fax through doximity was use but now I have to save the PDF, go into oximity to fax section, find file, then fax. Many extra steps which make it usually not worth it and instead I just share to my secured email and my office faxes them. That work around saves me time but not them!! Over one year ago I tried calling and could not get through to anyone. I posed a question in Facebook asking why optometrists were not included as we are a vital part of primary care and are indeed often on call. Now I see another review that dentists are not included either. This is sad that optometrists and dentists are not being allowed full access to features. The only word for it is discrimination. Crap program that acknowledges midlife provides such as NPs and PAs. Yet does not acknowledge dentists as doctors who would like to utilize this software. I love being able to call patients from my cell phone and have my office number appear in their Caller ID! I think the patients find that very helpful as well. I can now call my patients from my cell phone and my number remains private but the scrambler shows my ER’s number so my patient knows who’s calling. I can’t recommend Doximity high enough. Get it! Upset I'm not able to use app. 😡 I have been a Family Nurse Practitioner for years , and a Women's health Nurse Practitioner for 20 yrs. , but not yet master's. There's no option for my degree. Very unfair. I am rarely in the same place for more than a moment so relying on a freestanding fax machine never seemed to work . Being able to send and receive HIPAA compliant fax from anywhere has saved me countless hours and has spared many a tree . The ability to call patient and have my office number come up is such a relief. I am more willing to call patients when I am away from the office now. I love the Doximity Dialer app. It allows me to call my patients anytime anywhere without worrying about my phone number being shared. 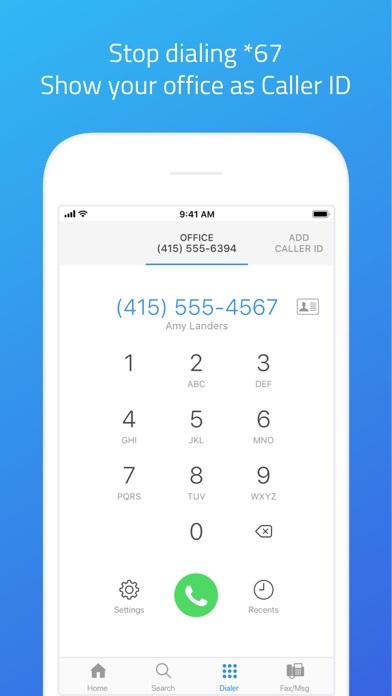 Once the dialer app merged with the base Doximity this app is now perfect for professional use. This app is great it has allowed me to start my own practice and cut down on overhead costs. I can speak to patients from my phone and it shows up as the office number. I have a fax that free and all of the referrals come thru my fax line which allows my office manager to run things right from home and I can do things on the go. I only wish when i used it online i still had the same signing capability that the phone app allows. It will have my office number even though I am calling for on my cell! As long as calling through app! 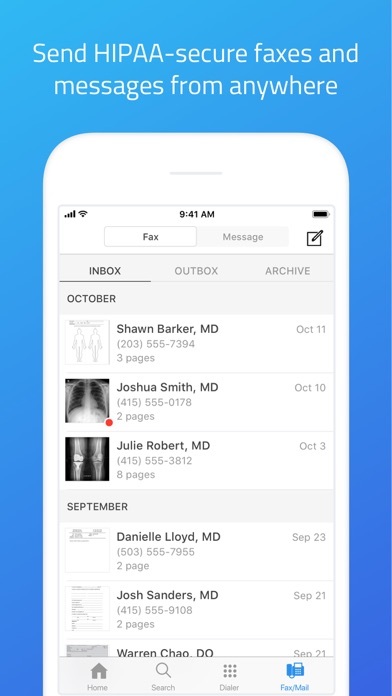 This is an awesome app that has been helpful in connecting with peers, calling patients, faxing, and reading articles. This should be on every physician’s phone. Easy to access from the phone. Makes it very reliable and it has up to date info. A way to call patients and have your office clinic # show up - very convenient! I love that your phone number shows as your office number through this app. 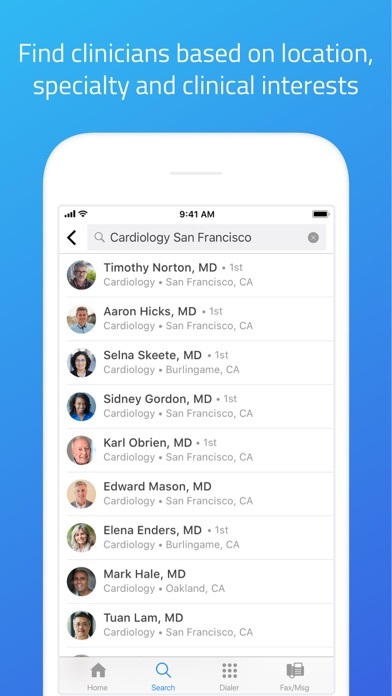 Gets rid of the call screening and call back from patients! The sign in and password requirements are very annoying and unnecessary. Great app for practitioners! Thank you Doximity. The call function and secure fax number are the best thing ever happened to us. Wish there was a texting function. I use it every day for its Dialer. Love the app! 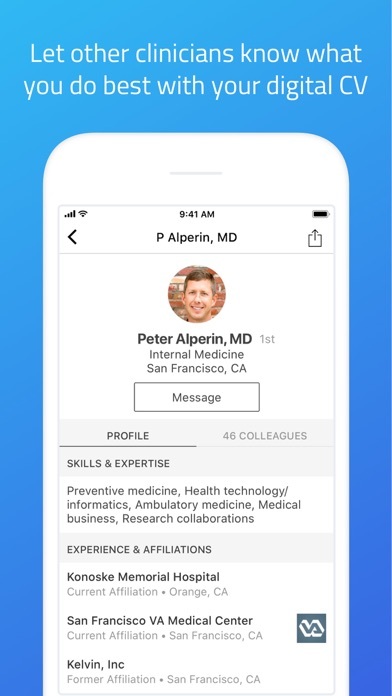 Helpful to be able to call patients from my cell with the app indicating my office number, especially when on call for other physicians. Great to reconnect with former classmates too! I Like the phone app - doximity Dialer as well. Good job! This app helps make all the hospital strains a bit easier. Really appreciate Doximity app developers putting this together. Please make iPad version with landscape view. Doximity itself is fantastic. 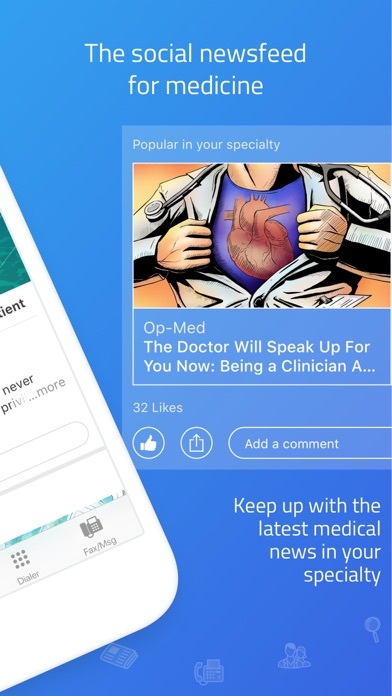 A virtual community for doctors. A great way to keep in touch. Two things primarily keep me from giving it 4 or 5 stars: 1) while the iphone app is great the version for the ipad is just an enlarged version of the iPhone app. It doesn’t even support landscape view! Which makes it a pain for those who use their iPads more like a laptop. 2) the jobs feature is great but needs to be expanded and include more postings and more granular information on salaries to be truly useful. It is a great start though!